If you don’t have anything nice to say, then don’t say anything at all. That’s the adage Gegard Mousasi stuck with when he spoke to 5thRound.com regarding Muhammed “King Mo” Lawal’s wrestling skills, as well as his “bitter” divorce with M-1 Global, the Russian-based company that had been directing his skyrocketing career. 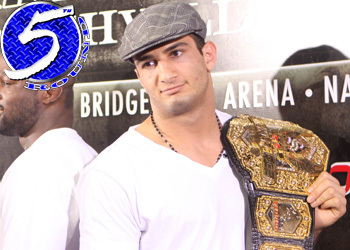 Following his abrupt exit from M-1 Global this past February, questions immediately sprouted regarding Mousasi’s current Strikeforce contract situation. On Thursday night, the 24-year-old inked a two-year, four-fight extension to remain with smaller organization – temporarily putting to bed talks of an Octagon emergence. Tonight’s show will be jumping off from inside the Bridgestone Arena in Tennessee. The CBS primtetime broadcast kicks off at 9PM ET/PT.